Are you like me - reticent to try new things because you don’t know how the day will shake out? Is there food nearby? What’s the washroom situation? Is it cash-only? How’s parking? Where do we rent gear? Is it busy? Will we stand out as imposters or outsiders? Don’t worry. I’ve done the ground work for you - at least at Telemark - by visiting with a gaggle of kids on a beautiful (and busy) day, acting like the confused newcomer so you don’t have to. (And yes, we all had a blast). Read on! As is always the case when travelling with kids, whether it’s to the grocery store or across town, “getting there” is an adventure in its own right. Be sure nobody’s socks are itching them, nobody has to pee, definitely play the “right” music (not Arcade Fire, this will make your tiny travel companions angry), and be prepared to answer the following question 20 times: “Are we almost at Starbright?” (what?). Travelling the vast distance from our starting point (Kelowna), we rolled up to Telemark at 11 a.m. and eventually found a spot to park. Parking’s free (yay! ), so just pick a place that speaks to you, and disembark. Unless you already have your own equipment and a trail pass, you’re going to want to head to the lodge. Note that the lodge isn’t in view of the parking lot, which is surrounded by trees and full of trim, athletic people in cool, form-fitting ski gear. If you’re like me, your 10-year-old snowboarding pants no longer do up (thank you Christmas holidays, also thank you kids), and they will be fastened with a hair elastic. If you ever feel self conscious about yourself, find me. I can help put your life in perspective. Anyway, from the parking lot, locate the main trail (you’ll see tons of people coming and going from it - follow them!) and it’s a short walk to the lodge. There you’ll find the washrooms, ticket and rental facility, and - if you’re with kids - the location to purchase, distribute and consume SNAAAAACKS! Your kids will probably want hot chocolate RIGHT AWAY! Have fun with that. The lodge is the central hub and main gathering place at Telemark. The upstairs portion includes the ticketing booth, a snack bar with hot drinks, large open cubbies to store your loot, cafeteria-style tables and chairs, a warming station along with a nifty place to hang your wet mitts and toques, and a kids’ play corner. Head downstairs (after paying for your pass upstairs) to get your rental gear (if you need any). “Can we have a snack yet? !” The lodge has a snack bar that includes hot drinks and basic snacks (like cookies, energy bars and chips), all at very affordable prices (like - $1 for coffee. It’s like a magnificent time warp). Take note, however, that by basic snacks I mean basic snacks - don’t expect to order a sub, a ceasar salad and a side of poutine. Most people around us brought their own bagged lunches. There’s a microwave if you want to re-heat your food, or - like the friends we came with - bring your own crockpot and leave it plugged in to keep warm! The washrooms are in their own separate building just beside the main lodge. To the relief of my children, they were “normal” washrooms that were heated, flushable, and clean. Telemark has roughly 60 km of snowshoe trails through quiet, pristine alpine forests, along five dedicated trails designed for every ability level. Snowshoe trail lengths vary from 250 m to 2, 4, 8, 10 and 15 km. The shorter trails (Chalet Loop and Pine Forest) wind through the forest surrounding the chalet, offer a variety of terrain, and were great for the kids. The 8 km Panorama Ridge trail starts at the chalet and ends up at the top of Panorama Ridge offering spectacular views over the Connector highway to the west and Lake Okanagan to the east. The 10 km Jack Creek trail follows an old logging road for most of its length and explores a remote area of our property along Jack Creek. There is a considerable 200 m elevation gain from the bottom of the creek to the trail summit. The Crystal Mountain trail begins at the 6.5 km mark of the Jack Creek trail and heads uphill – a major 330 m elevation gain – to the spectacular lookout at the top. There are lots of maps on site, and Telemark also has digital snowshoe trail maps to download onto your phone, for use with GPS. Do not snowshoe or walk on the cross country ski trails. Do not snowshoe in the dark. Telemark has more than 50 km of professionally-groomed cross country ski trails for skate and classic skiing, and for beginner and experienced skiers. There are even several trails lit for night time skiing. Rentals are available in the lodge, and skiers of all ability level are free to explore the dedicated trails, or use the small flat loop just beneath the lodge to practice and gain skill. Maps of trails are posted throughout Telemark, and can be found inside the lodge, along with helpful staff to guide you toward the appropriate trail for your level. For those of you looking to ski or snowshoe with your dog, Telemark has a 3 km ski trail suitable for both classic and skate skiing, as well as two different 3-km snowshoe trails for dogs. Park in the lot and the K9 trails are located across Glenrosa Road. A $5 trail fee applies — purchase a day pass in the lodge or use the drop box at the trail head. No dogs at the chalet or on the regular trails. Bring a sled, or a chariot with the ski attachment! You’ll need a day pass to use the trails, even if you bring your own equipment. Ski Pass: $14 adults. $7 youth (6 -18). Kids 5 and under are free. Night ski pass (4 - 9 p.m.): $7 adults. $4 youth. Early bird: $145 adult. $45 youth (5 -18). $310 family. Season Pass: $170 adult. $60 youth. $360 family. $325 + taxes per event plus $100 damage/cleaning deposit. Location: 4425 Glenrosa Road, West Kelowna. Kristen Thompson is a freelance journalist, and half of the team that makes up Do The Okanagan. 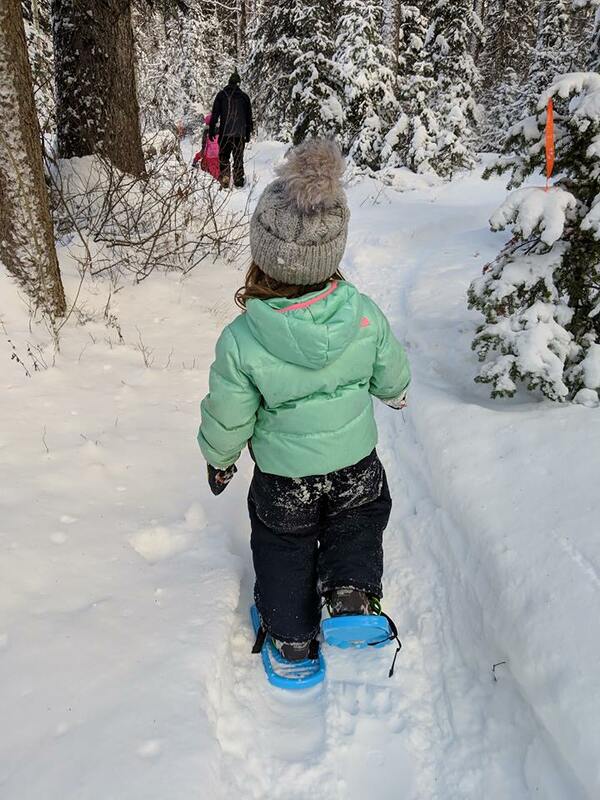 She’s a big fan of snowshoeing, so she’ll definitely be back for another Telemark Adventure… with, or without the cranky toddlers.